Wines After four days visiting marvelously beautiful vineyards in Switzerland’s pristine Vaud and Valais Cantons near Lake Geneva, it’s hard to deny that the spectacular setting hasn’t influenced my opinion of the wines! Yet in visiting several of the top grower/producers in these two important regions, there is no doubt that excellent wines are produced here, albeit at a high cost. We do not see many Swiss wines in the US; for that matter you don’t find them often in Europe. This is a pity. The Swiss drink most of their own production, and because production costs are high (23,000-55,ooo Ch [Swiss Francs] (1 Ch = $1.10US) per hectare for gobelet-trained vines; 45,000 Ch/hectare for vines on wire in Dezaley, according to doyen Louis-Phillip Bovard,) due to steep slopes, high density planting, low yields and all manual labor, the cost of a bottle really cannot be below 6-7 Ch/bottle for even a basic-level wine. The climate in these quasi-Alpine regions nestled among the Alps and in the upper Rhone Valley is continental, with some Mediterranean influences, as the reflected warmth from Lake Geneva on one hand, and the steep slopes above the Rhone river valley between Martigny and Sierre create a warmer climate. Yet precipitation near Lake Geneva’s Vaud area is twice that of the drier Valais in the Rhone Valley (1200 mm vs 600 mm, average). Beautiful dry and sunny autumn weather as I experienced in late Octobver is common. The last grapes typically harvested, and among the best wines in Switzerland are the Syrahs in the Valais, along with Petite Arvine and Marsanne left out to dry and concentrate on the vine for beautiful, honeyed, late harvest wines. In the Vaud, too, Pinot Noir can be stylish, too. The soils are quite varied, but primarily represent the decomposition of the granites and limestone rocks of the uplifted Alps, and the grinding down of the rock through glacial action. 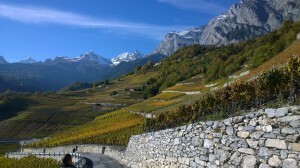 Vineyards lower down on the alluvial sections in Valais show more sandy, gravelly concentration, while higher up, particularly in the Vaud around Dezaley are more clay-ish in composition. One thing is certain; these are very poor soils, with natural drainage and thus generally modest to low yields. Switzerland’s unique local varieties share some commonality with the Val d’Aosta region of nearby Italy on the other side of the Alps. Grapes like Amigne, Petite Arvine and the red Humagne can make very good wines, especially Petite Armine, both dry and late harvest. 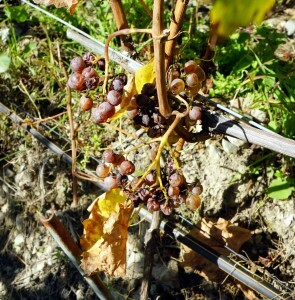 More particular are the unique crosses like Gamaret, Garanois and Diolinois, the first two Gamay x Reichensteiner (a white grape) and the latter Pinot Noir x Rubin Noir, a grape from France’s Drôme district. But there is no question among the producers that Chasselas is their bread and butter (and can be a high-priced spread at that!) while Pinot Noir, Syrah, and surprisingly, Merlot, produce the finest wines, albeit in smaller volume. Axel Maye’s (Domaine Simon Maye, Valais) 2012 Merlot AOC Chamoson has fine intensity, Bordelais-like structure and resembles fine Pomerol of years past before late-harvesting began there. Marie-Thèrése Chappaz’ 2013 Pinot Noir ‘Champ-Dury’ in Fully, from 40 year old vines farmed bio-dynamically is a wonderfully full, multi-layered wine that shows promise of aging well for another 5-7 years and has Cote de Nuits-like flavors. Bernard Cavé’s 2011 Syrah (Vaud) has fine raspberry-meaty fruit, fine tannins and Côte Rôtie-like finesse, while Germanier’s 2009 Cayas Syrah (Valais AOC) takes a refined, peppery and violet-scented approach to the grape with soft tannins and Crozes-Hermitage like fruit clarity. Didier Joris’ Syrah 2012 Osami (Chamoson-Valais) reflects some new oak influence, but such delicious raspberry-ish fruit and smoked meat that the firm tannins and overtly oaky finish suggest great intensity and spicy flavors for drinking within 4-5 years pleasurably. Of the white wines, my preference for complexity lies with Petite Arvine and Savignin Blanc (aka Heida or Paen), such as those of Mme Choppaz (both dry and superb late harvest). 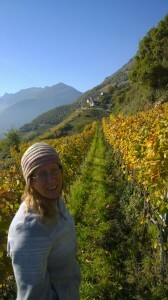 Yet Chasselas is the 800 pound gorilla for Swiss winegrowing–ubiquitous, generally bland, yet occasionally (miraculously) reaching superb quality and finesse. The problem lies in its lack of acidity, yet producers striving for richer texture use malolactic fermentation to make “fatter” wines, mistakenly(to me) creating wines with richer texture, sacrificing freshness and finesse. Yet the best producers pull this off, employing aging sur-lies in tank, foudre (large neutral casks) or cement tanks to add some richer textural notes. Tasting wine from Bovard, Cavé, Ducret, Maye and others, one clearly recognizes the potential of Chasselas, so long as yields are moderate and enough acidity remains to provide freshness. I should say that not all of the Chasselas managed this balancing act, but those that did revealed creamy textures, fine white peach-floral aromas and distinctive, minerally-stony flavors depending on terroir. I particularly like wine from Bovard, Cavé, Germanier and the top wines from Bovy and Ducret. Clearly, my take is just a snapshot- there are so many facets to Swiss wine; unique varieties, distinctive terroirs, conscientious winemakers. Talking with producers and several fellow journalists (Swiss included!) at the Digital Wine Communications Conference, the challenge Swiss wines have in the global market is their high production costs, and thus high export cost as well. Switzerland makes some very high quality wines, to be sure. They are not globally competitive, as well as there being some varieties of only local interest. 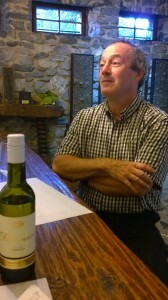 That said, the quality and distinctive character of many wines suggests that a wider audience would be favorably inclined to trying them as long as the export prices can be adjusted competitively in line with the less expensive wines of Burgundy and mid-priced wines ($18-30) from California or Tuscany. This won’t be easy given production costs in top vineyards, granted. But all of us should reach out and try some of Switzerland’s best wines.